DiscountPaint.net :: MANUFACTURERS :: ABSOLUTE COATINGS :: ZIP STRIP 272001 PREMIUM PAINT AND FINISH REMOVER SIZE:1 GALLON PACK:2 PCS. 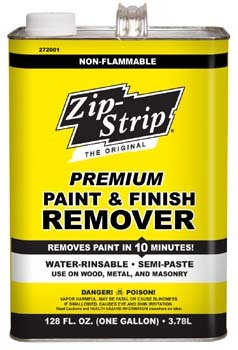 ZIP STRIP 272001 PREMIUM PAINT AND FINISH REMOVER SIZE:1 GALLON PACK:2 PCS. Zip-Strip Premium Paint & Finish Remover is asked for by name more than any other paint and finish remover sold in the U.S. If you were to buy one remover to use on all of your projects, this would be the one. It has a non-flammable, semi-paste formula that works fast on vertical and horizontal surfaces. One application will remove five to six coats of enamel, oil and latex paint, urethane, polyurethane, shellac, lacquer, water-based finish and varnish. Zip-Strip Premium Paint & Finish Remover is suitable for interior as well as exterior applications. It will not raise the grain or discolor the wood. No neutralizing is required. It removes easily with a scraper, putty knife or steel wool. Capable of removing 5-6 coats. DEFT 01504 LACQUER SANDING SEALER SIZE:QUART. GEMINI SOL-0500-5 #500 LACQUER THINNER SIZE:5 GALLONS. DUCKBACK DB-6080-4 MASON SELECT TERRA COTTA TRANSPARENT CONCRETE STAIN SIZE:1 GALLON. RUSTOLEUM 19428 1942830 SPRAY PAINT FLUORESCENT YELLOW SPECIALTY SIZE:11 OZ. SPRAY PACK:6 PCS. MODERN MASTERS 39601 ME-396 REACTIVE METALLIC PAINT BRONZE SIZE:1 GALLON. DUCKBACK SC-1901-4 CEDAR EXTERIOR TRANSPARENT STAIN CLEAN AIR FORMULA 100 VOC SIZE:1 GALLON.